Meadowridge Veterinary Hospital (MVH) is a full-service small animal veterinary hospital providing comprehensive medical, surgical and dental care, plus behavioral and nutritional advice. 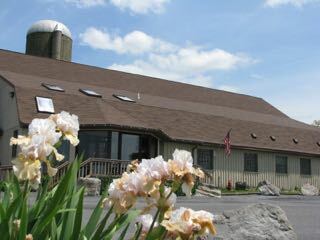 It is also the home of The Boarding Barn for Pets. Located a short drive from Ithaca, MVH has been helping pets from the communities of Lansing, Genoa, Kings Ferry, Groton and Locke for over 25 years. Here at MVH we strive to offer sound advice along with care tailored to your pet. Our job is not only to treat your pets when they are not feeling well, but to help you learn how to keep your best friends happy and healthy throughout their lifespans. We have a strong interest in pet behavior, and apply what we have learned to help insure the most stress-free, enjoyable visit possible for you and your pet. We provide information and assistance in integrating your pet into your family's lifestyle. We even provide a complimentary "skills session" for your new puppy or kitten. We provide a broad spectrum of diagnostic procedures through in-house testing and the use of external laboratories. We also work closely with the NYS College of Veterinary Medicine and local referral practices when special diagnostic procedures or treatments are required. Our facility includes a well-stocked pharmacy, a surgery suite, x-ray capabilities, a closely supervised hospitalization area, and indoor boarding kennels with outdoor walking areas.